Apricots are important icons to several cultures around the world. The stone fruit is as important as olives to other cultures. Like olives in some places in the Middle and Near East, intentionally destroying an apricot tree is such an extreme insult over which people that are willing to kill. The apricot we know today may have been developed in Armenia up to 8,000 years ago. Apricots have been identified as cultivated in India 5,000 years ago. Spanish Missionaries carried apricot seedlings west across North America as they carried the Gospel and sought golden salvation in the Mediterranean-climate of California. The pale orange fruit dries into a golden bronze coin when not treated with preservatives. Apricots were an important commodity in along the Persian and Silk Road trade routes. Today, Turkey is the largest producer of dried apricots. 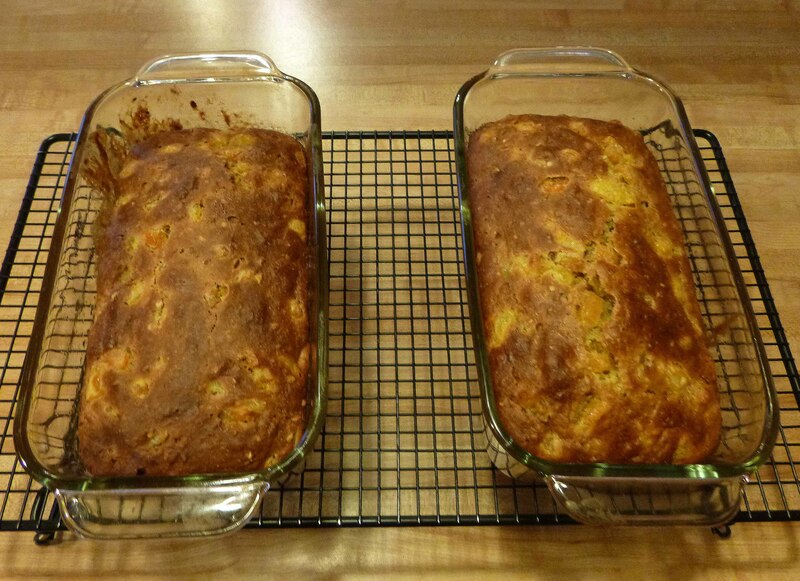 The recipe for Dried Apricot-Pecan Bread is one of my favorite quick bread recipes. I shared it at work several times a year. My English and Irish co-workers called it a wonderful tea bread. I considered this the best critique available. It is best served cool and sliced thin with a very sharp knife. Sweetened butter is best. I need to first say I love this cookbook, but that does not mean the recipes do not need to be tweaked to bake the best bread. I have been using the cookbook for over ten years and each recipe has its own adjustments. I recommend the Turkey apricots over the California apricots. I use kitchen scissors to cut the dried fruit into not quite match stick size, but maybe two match sticks wide pieces. When you hydrate the 12 oz chopped, dried apricots, you can use 8 oz water, or orange juice, or orange liqueur. There is nothing special to the mixing of the dry ingredients. Use the best flour you can afford. It really does make a difference in the finished bread. The 1/2 cup whole-wheat flour which the recipe called for and I used in the photographed loaves here was ground by my father from wheat berries he purchased from King Arthur Flour at their office in Atchison, Kansas in a Vitamix food processor. My family takes flour quality very seriously. The recipe calls for 1 cup of sugar which is included in the first step when you marinate the apricots. I used a half cup of finely granulated sugar and in this batch I think that was to much. The surface of the bread was much to brown, in my opinion. That said, I had a nice center crack on one loaf, which indicated good expansion during baking. The recipe calls to allow the dough to rest 15 minutes before placing in the pre-heated oven. I allowed the dough to rest 20 minutes before baking. It has been suggested if I want to avoid the quick bread from cracking on its top surface I need to allow the dough to rest before baking. I think this is important especially when dealing with quick bread recipes that rely on baking soda for expansion, such as this recipe. The 4 oz plus a little orange juice added at the end provides the acidity to trigger the baking soda and any expansion that occurs before and during baking. When combining liquids, mix the two eggs with the 4 oz orange juice, then add to the rest of the ingredients. I do not recommend substituting orange liqueur. You need the orange juice acidity to interact with the baking soda. My main complaint about the recipes in the cook book is that they consistently do not call for enough liquid to adequately combine the dry ingredients with the wet ingredients. I have had the best results in hand mixing this recipe. It is very important to not over-mix but the dry ingredients do need to be evenly moistened. Add more liquid, here orange juice, a tablespoon at a time until the flour does not stick to the mixing bowl. The recipe calls for 60 minutes baking time, but this recipe is done, provides a clean toothpick when inserted into the top of each loaf, right at 50 minutes. Dried Apricot-Pecan Bread is wonderful at a brunch, on a picnic served with paper-thin slices of honey ham and a small amount of marmalade, or as a mid-afternoon snack with cream cheese. This quick bread can be as sophisticated or as simple as you desire. The recipe book I use is The Best Quick Breads: 150 Recipes for Muffins, Scones, Shortcakes, Gingerbreads, Cornbreads, Coffeecakes, and More published in 2000 by The Harvard Common Press. ISBN: 1-55832-171-3 It appears the book was republished in 2012.